Yowza, this week’s hashtag, #StarWarsFirst proved more interesting, exciting, and heartfelt than I could’ve possibly imagined. I’m thrilled to share some folks’ stories with you. 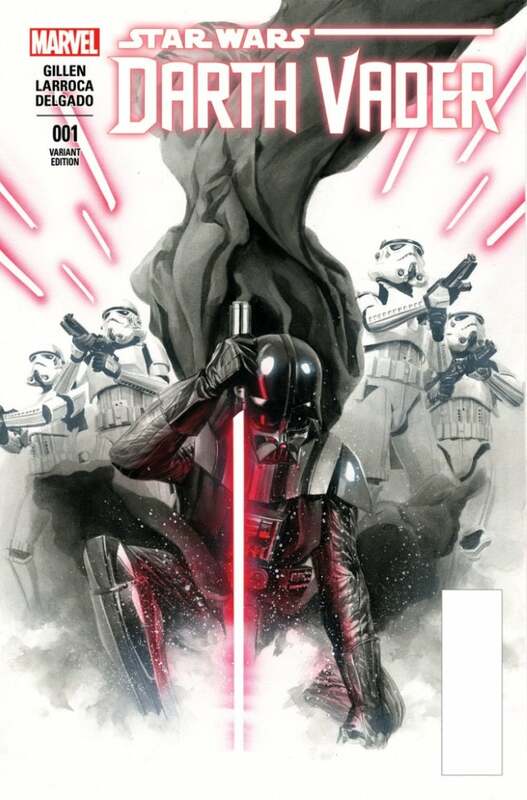 The second part of today’s column is a fun one too: we chat with Kieron Gillen, writer of the new series Darth Vader which debuts with Marvel Comics today. He talks big time SPOILERS from today’s first issue, his philosophies about Darth Vader, and gives us some teases about what’s to come in the first arc (and just how far ahead he and Jason Aaron are in planning these ongoing books!). First, a friendly reminder about the Star Wars Humble Bundle; it’s pay-what-you-want for, now, twelve Star Wars games for PC (some work on Mac, too), and you only have to pay a dollar a game to unlock all of them (two were added in the last week). You have six days left on this bundle, and proceeds go to charity. It’s a win-win! 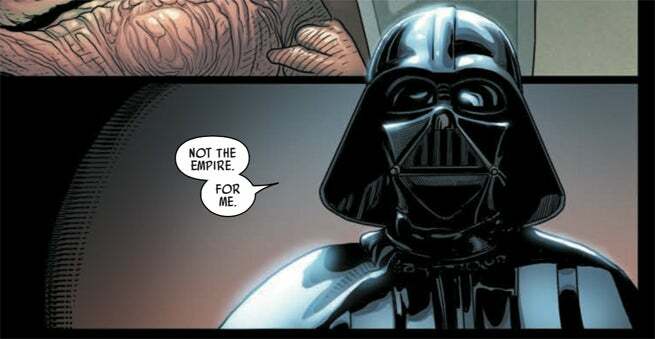 And here’s my mini-review of Darth Vader #1: surprising (to me) elements of memory, connection, and a lot of pure, evil fun. Read it! Now, to your tweets and Facebook posts about your #StarWarsFirst. Please, feel free to continue to participate in the comments section and on twitter. This is always a fun one. Also, a shout out to Full of Sith, the podcast that asks this question of their guests, whom I outright stole it from. @LucasSiegel @ComicBookdotcom I saw a VHS copy of Star Wars at my local library, and forced my mom to rent it for me. The rest is history. @LucasSiegel @ComicBookdotcom Dad sat me down one day when I was ten and we watched the original trilogy. Indeed, it seems a lot of these memories are tied specifically to parents. Now, a selection of memories from Facebook. Jeremy Voss, Video Game Journalist: "I was aware of Star Wars before this, but my first actual SW memory is being 7 years old and seeing Return of the Jedi in the theater, and being absolutely gob-smacked by the speeder chase sequence in the Endor forest." Shaun Manning, Comic Book Journalist: "You know what's sick? I had Star Wars toys as a kid but didn't actually see the movies until high school. Before the Special Editions hit theatres, some friends and I rented the VHS tapes of the originals. That was a good party, and I put together a nice big group to see A New Hope in theatres. Which was also amazing. So mostly for me, it's about friends having a good time together." Andrew J. Rostan, Graphic Novelist: "My first experience was in preschool, where one classroom had the giant, fully illustrated storybook for Return of the Jedi. I had no idea who these people were but everything looked so magnificently otherworldly and Jabba the Hutt was just fascinating. I made my parents rent Jedi soon after...and by a trick of fate, I saw the entire trilogy in reverse order. I'm a weirdo." Roger DiLuigi, Making Me Feel Old: "My parents took me to the release of the special edition original trilogy in theaters and I was hooked." Schaffer the Darklord, Rapper: "My mom took me to see Star Wars in the theater. I was 3 years old. Darth Vader walked through the cloud of smoke on board the blockade runner, AND THEN I NEVER GREW UP." Ethan Sacks, NY Daily News: "One of my earliest memories in life is being four years old and my dad taking me to see it in Times Square in the summer of 1977. I can still see the screen as the text scrolled down (I couldn't really read it.) and the music. And whenever I have the memory, it's so intense, it's like my dad is alive again. Yeah, it's not just a movie." Jeff Carlisle, Star Wars artist: "1977, I was four years old. My dad went to see the film to see if it was alright for my older brother and I to watch...and he was very excited. He was telling us the basic story, got all the names wrong except for Darth Vader, and had us generally pumped to see it. I still remember my dad quietly reading me the words "a long time ago, in a galaxy far, far away..." before the music started...and reading the opening crawl to me like a storybook....and then the Star Destroyer flew overhead and it was love at first sight. And 38 years later, it still is." Janet K. Lee, Comic Book Artist: "My dad took us to see A New Hope after my sister and I got back from summer camp. It was an old, single-screen theater and back then you could sit through as many viewings as you wanted with one ticket. So we stayed, and stayed. And stayed. All day. 4 viewings. Years later, I remember my dad borrowed a *laser disk* player from a friend so we could rewatch Episode 4 before heading out to spend the day watching Empire Strikes Back. Those fighter sequences...they were just miraculous back then. My other biggest memory? Mom never let us pay for popcorn, so we had to smuggle in sandwich baggies of it from home." Rantz Hoseley, Comic Book Writer, Artist, Designer, etc: "My father and I had a... Challenging... Relationship to say the least. One of the very few high points was when he took me to the crappy little 300 seat theatre in 1977 to see Star Wars. From the moment the rebel blockade runner came onscreen, chased by the star destroyer... And the fact that it seemed SO DAMN BIG... I was hooked and the course of my life was altered completely." Rachel Rossilli, Star Wars Cosplayer & Superfan: "When I was 6 my dad tried to show me a new hope. Darth Vader came onto the ship and scared me so bad I didn't want to watch the rest. I was a shy little girl! Then at 12 my brother wanted to rent the movies and watch the trilogy (1997). After the first movie was over I started screaming "put the next one in put the next one in!" That was it. Star Wars birthdays and posters were evermore." Thank you so much for sharing, everyone. As for me? I was introduced to Star Wars through my brother and his original action figures. He also liked to build his own original creations out of LEGO, which largely informed many things that I would later fall in love with. Aside from the Soldier Field model with hand-painted jersey numbers on the backs of minifigs to mimic the '85 Bears, he also once built the Spire scene from Empire, and acted it out - I saw him do that before I even saw the movies. Next week's hashtag is: #StarWarsVehicle - What is the coolest, what would you most want to drive/fly/ride/control? Also, hit me with your suggestions on future hashtags! Okay folks, SPOILERS ON for Darth Vader #1, as Kieron Gillen and I discuss the debut, and get into the psychology of the character, plus some teases for #2 and beyond! Kieron, one of the things that really surprised me in this first issue is just how much Darth Vader remembers his life as Anakin Skywalker. That always seemed somewhat ambiguous to me, as to whether or not he did remember, and it seemed like a bold choice. How did you go about incorporating that? Kieron Gillen: Well to me, it was like, he remembers but he doesn’t like remembering. I came to that because I couldn’t work out why he would forget! Of course his primal sin moment at the end of Revenge of the Sith is entirely based on his memories, and that’s quite a big deal. (laughs) Even if you fast forward to Empire, and the entire concept of Luke being his son – it’s more about what having a son means to him. All those kinds of things then mean that this is of some importance. Even when he sees Obi-Wan, and whatever. That actual previous relationship must be there. The trick for me is writing it kind of inside out. I really just couldn’t workout a way not to include it. In your reading and watching it may have been ambiguous, but for me, I couldn’t figure out a way his memories could not possibly be part of him. So for me, it’s drawing the line between the two [moments], because what you have to remember is there’s a 20 year difference here. The guy he remembers and who he is are 20 years apart. While he’s fundamentally changed, you have to remember there are core motivations there that then extrapolate out into the rest of the series. Very cool. One of the other things I’d say was surprising… well, aside from that last page (laughs). That was one of my favorite plays on the memories of Anakin; I like the idea that every time he ever goes to Tattooine, he just slaughters a bunch of sand people. KG: (laughs) Well that’s the case of, he doesn’t go to Tattooine very often, and he avoids it for very obvious reasons. See, we have a bit of a “Dirty Dozen” structure to the story. Vader goes around and he collects his crew, and builds his power structure through a variety of things. It’s really quite episodic. Each beat moves the meta plot forward. So in each issue, Darth has this adventure, and something meaningful happens. That struck me as… well, it wasn’t too far from just, he’s on Tattooine, he’s got a few hours to kill, what’s he going to do? (laughs) I exaggerate slightly, but it’s a bit like that! And it hits on the line that here’s a guy who will just completely kill a village full of people on an old grudge, and it reveals a bit of how much of what Anakin was is still underneath the mask, you know? And you know, it certainly sets our story out. End of first issue, he butchers a lot of people: he might be a bad guy! That’s what I’m trying to get across. Darth Vader, he might be a bad guy, okay. KG: Yeah, yeah! I’m worried some people might miss it, but I think it’s definitely there if you look for it. 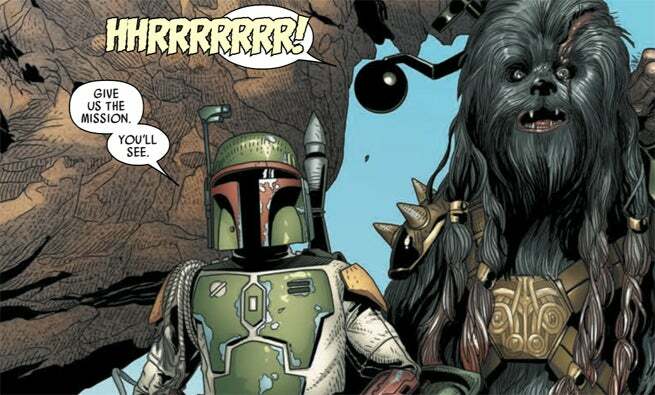 The issue also was very intertwined with the issues so far of Jason Aaron’s Star Wars. Is that something that will continue throughout, or will you be more breaking off on your own to have your own adventure with Vader? KG: The way I normally describe it is, it’s like when Jason and I were writing – I was writing Uncanny X-Men, and he was writing Wolverine and the X-Men. They both have a similar inciting incident, then go kind of in parallel lines for quite awhile. But they both still have a soft interplay between them, and you can see elements from one book appearing in the other. Then we’ll come together for a crossover, and come apart again, that kind of thing. That’s kind of what we’re doing here. As you see, the end of the first issue, Boba Fett is sent after Luke. You might imagine that since Luke is primarily in Star Wars, that’s something for Jason to deal with. And in my case, Black Krrsantan (that’s still something I’m learning to pronounce, despite having invented him), that’s something I’ll have to deal with as well. So our books might come together when Boba Fett… well, you know what I mean. Both of them can be read individually, that’s always the aim, but we are both building off the same inciting incident from Jason’s book. This is the mirror. We have different challenges. Jason’s challenge is to make a book that feels like Star Wars. I have to make a Darth Vader book that feels like Star Wars while really being completely different. The way the Empire is in the Star Wars films, is as a big faceless jackboot. That’s not a very interesting comic! (laughs) If no one has any character, it’s kind of a monocharacter almost, and that wouldn’t really be Star Wars. So part of my challenge is building a book that’s a dark mirror to Star Wars. I need to find the things that make it Star Wars, whilst being about and in the perspective of Darth Vader. That’s why I started with the homage to Luke’s arrival in Jabba’s palace. I mean, A, hopefully the homage makes you smile a little bit, but the point being that Vader handles things very differently to Luke. It’s a really good way to demonstrate that we’re doing Star Wars, but we’re doing things a bit differently. In the same way, Jason’s is really Luke’s book, he’s the core character there, and of both the movies and the comic. In my book, Vader is the lead character, he’s our Luke, and the people that come around him are the satellite characters in the same way that Han, Leia, and Chewie are for Luke. That’s the grounding I’m trying to set up; I sort of have a few masters. Abstractly, I need to explain just enough of what just happened in Star Wars #2, while also explaining that we’re picking up just after A New Hope, and I’m setting up the status quo… People get the status quo of the Rebels pretty easily, but what’s going on in the Empire might take a little more hand-holding. It’s a complicated job of what I’m doing, shall we say? What can you tell us about this mysterious other guy hanging out with the Emperor? It looks like – does he have a Rodian’s eye and a portion of a Rodian’s face there? KG: He does definitely appear to have a Rodian’s eye, and bits of cybernetics. That was, immediately – originally, I just said I wanted him to be a guy who obviously has got stuff up with him. You can sort of work out things… he definitely has a Rodian’s eye, and he’s not a Rodian; that implies the sort of things this guy might get up to. And there’s the bits of cybernetics. He’s – finding out who he is, is definitely one of the core elements of the book. Finding out why the Emperor is hiding him from Vader, and what else he might be hiding is one of the tasks. The other big issue is Vader’s new position beneath Tagge, that’s something else he’ll have to deal with. And of course he’s also building his own thing kind of on the side. Boba and Black Krrsantan are the first piece of that; Vader is trying to figure out what he can do off the books. So basically, I cannot tell you anything about that dude, except that he’s important, and he definitely has a Rodian’s eye. We went back and forth on what sort of alien to put in there. There has always been some question as to how devoted Vader is to the Emperor, and especially right now when he’s being punished for being the only survivor – is Vader’s, as he’s doing these things behind the scenes, is that part of him making his own small moves against the Emperor, or is it just protecting himself? You come in from Star Wars, and he’s in this position where he’s obviously the right hand, he’s a big guy, but he’s not more important than Tarkin – there’s an equivalence between him and Tarkin, and how Vader talks to different people. He doesn’t kill many people in A New Hope, whilst in the second movie, he just starts choking dudes because he can – he’s acting much more powerful, and he’s a fleet commander – he’s in a much better position. But when you think about it, he must have been in a bad position after the Death Star was destroyed. So he must have done things to get into that better position, and become more powerful than he’s ever been. That’s an interesting story for me, what he does to achieve that. And while like I said, Vader’s been this for 20 years, and he’s done a lot in that time, in some ways he’s been in a holding pattern. Since that shock on Mustafar, he’s been in orbit – between the Death Star’s destruction, the reappearance of Obi-Wan, and now these appearances of this strange boy who somehow has Anakin’s old lightsaber; all these kinds of things, his life is shook up. And at the same time, Palpatine is very angry with him. As you might imagine, it’s probably a bad time for Palpatine to be angry with Vader, with what he’s about to learn. Any specific teases of something in Darth Vader #2 that you’re especially excited for people to see? KG: Well, we get Tagge back, who is now in a position overseeing the fleet. My conception of him, is he’s the guy who was kind of anti-Death Star, he thought it was putting all your eggs in one basket. If you poured those resources into a bigger fleet, “we could probably do more.” He’s also kind of the graphs guy – he’s just as evil as Vader in many ways, but he also thinks to rule the galaxy, we’ve got to plot everything out in graphs – the accountants rule the world! (laughs) So that’s a very different view of how the Empire should be run, counter to the romantic philosophy of Vader. Vader thinks the power, the immaterial of the Force is the real way. 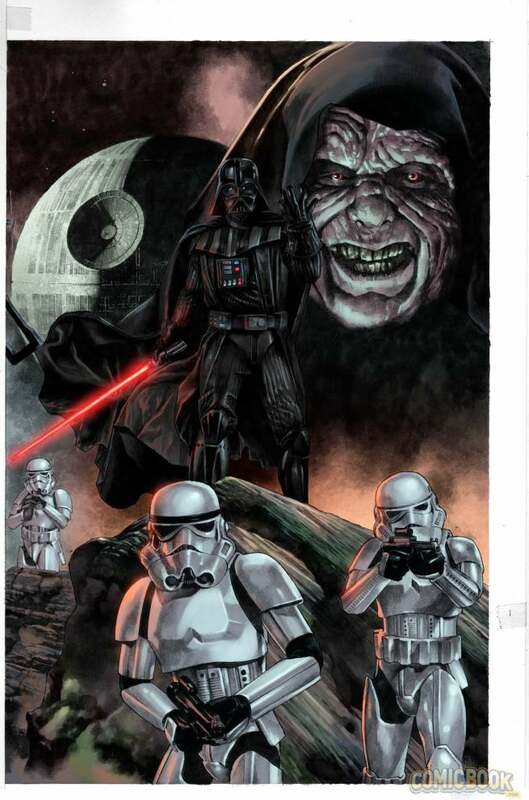 So a lot of the book is the push and pull between Vader and these other figures of the Empire, who have different ways of seeing the world to him. The interplay between the two, especially Vader dealing with having to be in a subservient position to Tagge, shall we say, Vader doesn’t deal with it well. (laughs) And the sort of things he does while also not – you start to get the sense of him doing stuff and not wanting to be found out. 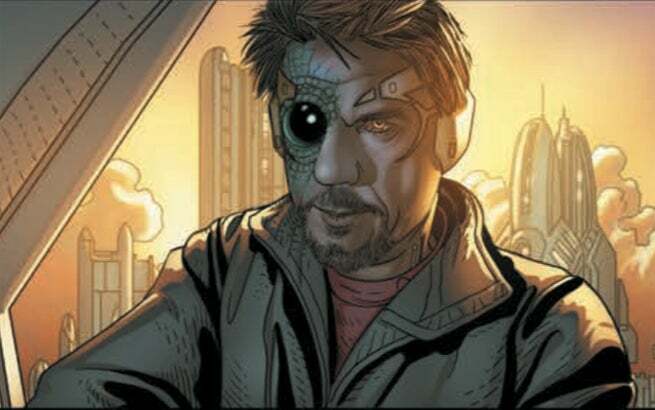 We started seeing that in the first issue, and in the second issue we’ll see how far he’ll go. Then we’ll go on from there. I am actually currently in San Francisco – we just met up with the Story Group at Lucasfilm. So me and Jason and everybody just hang around for the last few days, and we’ve been working out the end of year one, the start of year two, how the books are going to interlink, how stories feed back and forth between them, what the powerful sense of these being “our books.” At these meetings, you see all the pieces being put on the board, and we’ve got so many toys! (laughs) It’s a really good mix of stuff! I think my wife put it – after she read the first issue, and she’s an enormous Star Wars fan, she loved it, which is always nice when my wife likes my stuff – but she said it was the perfect mix of stuff you were aware of [from the films] and also stuff you were not aware of, and that’s our aim. We want it to feel Star Wars, but we also want it to feel fresh and new, as opposed to just recapitulating the greatest hits. That’s always been our magnetic North on these books.